Focus on building an experience relatable to your brand – Use technology to achieve that goal. Shirish Deodhar founded Sapience along with 3 other co-founders (Madhukar Bhatia, Swati Deodhar, Hemant Joshi). They each have 25+ years of experience, and previously co-founded and built two IT services companies that were qcuired by global majors. After the second exit, they decided to take a break and began mentoring a few product start-ups. While doing this, they realized that most founders had very similar questions. 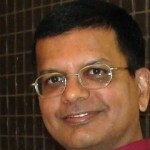 Spurred by this, Shirish wrote a book titled From Entrepreneurs to Leaders, which was published by McGraw Hill in 2010. Meanwhile, one of the product ideas that one of the co-founders (Swati) was working on, received funding from Indian Angel Networks. They set a condition that all of them should be full-time on board. The product was aimed at providing enterprise effort analytics for growing companies wanting to stay competitive with a highly engaged and productive workforce. Even though the four founders were well-experienced in sales, technology, marketing they realized that it wasn’t going to suffice as their earlier experiences were around selling engineering capabilities but not in selling a product. Adding to the complexity was the fact that this was the only product of it’s kind, which meant that they had sell the concept and create a market for it. Also, in their past IT Services companies, the revenue was always ahead of the expenses , whereas a product company needs to invest heavily before it can start earning significant revenue and eventually become profitable. To start with, Shirish and team began reaching out to the management of mid-sized and large companies. Founders have to start with leveraging your own network, and look for leaders who are willing to innovate and work with start-ups with products that can help their business. In what he terms as the ‘Expanding Spider Web’ approach, they began connecting with their own circle of CEO-level contacts which were a result of their earlier engagements over 2 decades. However, they still encountered the classic innovation curve where no matter how encouraging the initial conversations were, not more than 2% of the connects agreed to conduct a POC of the product at their companies. While demonstrating the benefits of the analytical solution to the prospects, Shirish and team began highlighting that insights about the aggregate work patterns coupled with the workforce trends collected in an anonymous manner would be a great means to motivate the workforce. What prominently came to the fore was a common trend at the manager level to over-utilize the top performers leaving the rest with less work to do. This often leads to attrition, mostly amongst the new hires not getting enough attention from their managers, or those with several years in the company who get bored with the same routine work. This meant that only 20-30% of the workforce was adequately engaged at work. Their new product helped track these issues. It also solved the challenge of lack of visibility in instances where companies had people working from home. Their clients soon saw the benefits of Sapience in helping them walk the talk on work-life balance, instead of promoting regressive policies like increased work hours, which given today’s long commutes, leaves no personal life for employees. They understood the need to focus on “Time on Work” rather than “Time in office” and hence gain both improved productivity as well as a less stressed and engaged workforce. Shirish recollects two significant pivots they had to make in the product in the first 18 months. Right at the start, they had built a product that automatically captured metrics from different software tools that existed in the company, and consolidate this on a single dashboard. Post implementation, they realized that although this was a great solution it couldn’t have been converted into a great product because of the need to integrate with and stay up to date with so many tools that companies use. Instead they realized that the prototype captured a more basic and invaluable asset, which is the employees’ time on these tools. They concluded that the analytics on this basic data itself was very revealing. Most companies were shocked to see their relatively junior employees spending 40% of time on emails and 10-15% on meetings which meant that 2/3rd of their day was being spent away from their core tasks. The important take-away from this analysis was that measuring the effectiveness of the time spent by employees can become an important step towards optimizing it. It was this idea that became the crux of the product that is today. The second pivot was to discard a key feature in their product – which was a task management module intended to map user time to tasks that were assigned to them. Most small companies had this task data on excel sheets and began importing the data into the tool. Managers began ignoring the real value of Sapience, and kept debating the pluses and minuses of the task management features. Shirish and team realized that this was a distraction, and took the extremely difficult decision to drop the task management feature. They stayed with the core concept that nobody else had ever implemented, and decided to perfect it. Shirish’s advice to the budding entrepreneurs – know the value that you are delivering from your product and be prepared to give up on certain features when it is not delivering real value. When the entire market was telling them to improve the Task Management software, what they instead did was to get rid of it because it was distracting them from solving a bigger problem. Shirish also advices founders to work with passion but also know that the ultimate goal is not just about doing something cool but also about selling and making money. He says that there is a lot of difference between an idea, an innovation and a successful product. He says that all founders have to realize that they are into a product business and not a technology exercise. Sapience Analytics (www.sapience.net) presently has 48 employees, and their product is deployed for more than 100,000 users in 8 countries and 60+ customers, which include four Fortune 200 companies. Sapience focussed on the Indian market for the first 4 years and they recently opened a US subsidiary. They received INR 45 Cr in Series B funding in October, which will be used for global sales and marketing. To quote a few of the dozen awards the product has received: Deloitte ranked them 98th company in the Fast 500 Technology list for Asia Pacific and the 7th fastest in India. TiE Silicon Valley ranked them as in their Top 50 innovative companies in May 2014. Frost & Sullivan gave them the ICT Award for Product Innovation Leadership (Functional Analytics).